Watching Wes Anderson’s The Grand Budapest Hotel, I wondered whether the Marx Brothers wouldn’t have fit right into the visual intricacies and loopy grandeur of Anderson’s impressive production. It’s not that Anderson’s nostalgic comedy has an antic spirit or that it’s full of rapid-fire word play, it’s more that Anderson has concocted a fantasy that embodies the feeling of European culture at a certain moment, perhaps the interval between two world wars. Anderson creates a time full of aristocratic pretension, ornate elegance and formal manners. The Marx brothers probably would have trashed this world, created by Anderson in the fictional Eastern European country of Zubrowka. Anderson may not embrace everything about this bygone environment, but he establishes it with astonishing precision. At times, it almost seems as if the entire production belongs inside a snow globe. Anderson’s great strengths center on production design, color and visual wit. Even a young woman’s face can’t be presented without adornment. Saoirse Ronan’s Agatha, for example, has a swooping red birthmark on the right side of her face. A young lobby boy at the once stately Budapest Hotel draws a pencil thin mustache under his nose. Considerable pleasures can be found in Anderson’s mixture of artifice and art: Anderson creates a charmed atmosphere in which the principal characters are introduced along with the main story line, a tale told by Zero Mustafa (F. Murray Abraham ) to a writer (Jude Law) who’s visiting the Grand Budapest. Mustafa explains how he came to own the Grand Budapest, which — at this point in the tale — is in a near-fatal state of decline. Thus begins a flashback. 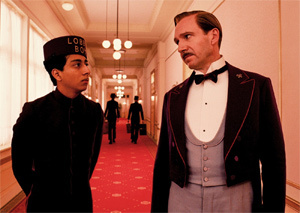 As a young lobby boy, Mustafa found a mentor in Gustave H. (Ralph Fiennes). Gustave becomes the movie’s most memorable character, a concierge so well-schooled in the arts of service that he has sexual liaisons with many of the hotel’s elderly women guests. They adore him, even though Gustave may have been a homosexual. What ever his sexual preference, Gustave embodies all the surface qualities necessary to create the illusion of taste and distinction so vital to a certain segment of European civilization. By the time, the movie is over, Anderson deepens his definition of what it means to be civilized, particularly when one realizes that life is brutish, short, and subject to violent intrusions by war and other catastrophes. Anderson’s complicated, story-within-stories plot eventually comes to revolve around a supposedly priceless painting called “Boy with Apple.” The painting is left to Gustave by Madame D. (an unrecognizable Tilda Swinton), one of his aging fans. Madame D’s son Dimitri (Adrien Brody) wants the painting back. A tangle of betrayals and murders ensue. At times, the plot — which includes a prison break — has the over-stuffed feel of excess baggage. That bothered me a bit, but with this kind of movie, the icing tends to be far more important than the cake, a fitting comparison because elaborately decorated pastries play a key role in advancing the plot. Although Grand Budapest Hotel is small and highly polished, it boasts a large cast that includes Jeff Goldblum, Harvey Keitel, Bill Murray, Willem Dafoe, Mathieu Amalric, Tom Wilkinson, Edward Norton and, in passing, Owen Wilson. The heart of the story belongs to Fiennes and newcomer Rivolori. The two create a relationship in which Gustave — a man known for his “liberal” use of perfume — develops a genuine fondness for his young charge. If there’s a love story here, it’s between Gustave and Mustafa. The movie ends with a title card that pays homage to Stefan Zweig, an Austrian writer credited with inspiring the script and who seems connected to some of the sensibilities that seem to interest Anderson. Overwhelmed by a rising barbarity in the world, Zweig committed suicide in 1942. In a way, The Grand Budapest Hotel is a movie about sensibility. Gustave’s refinements of speech (broken by the occasional epithet) contrast with Dmitri’s bluntness: Brody sounds as if he arrived in Zubrowka after a stop in one of New York’s outer boroughs. I can’t say that Grand Budapest proceeds without sometimes losing steam. But there are enough rare sights to make the journey worthwhile: An elevator with a shocking red interior, the pink grandeur of the hotel’s facade, and the changing aspect ratios that Anderson uses to evoke times past. Moreover, the overplayed gentility of the characters remains quietly amusing throughout. But there’s a problem in all this: Anderson’s sensibilities are so refined that he sometimes seems to lose sight of the audience. I enjoyed The Grand Budapest Hotel enough, but also sometimes saw it as a kind of art object, something too far removed from recognizable experience to encourage connection. By now, though, most audiences have come to regard Anderson (Moonrise Kingdom, The Darjeeling Limited, The Life Aquatic with Steve Zissou and Rushmore) as an acquired taste. The taste here? Call it bittersweet.